Spent Sunday afternoon at the Buckinghamshire Railway Centre just outside Aylesbury. The centre covers about 25 acres and has something for everyone. 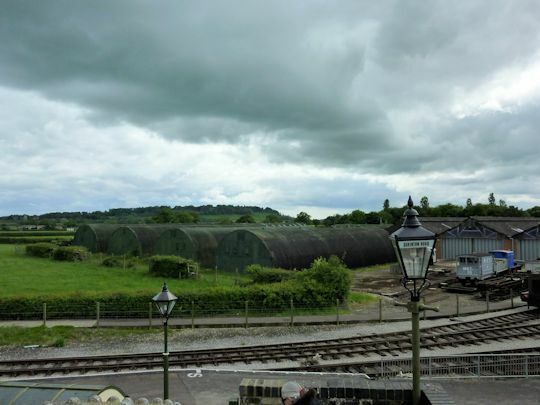 Part of the site is used by the Vale of Aylesbury Model Engineering Society (VAMES) who have several permanent layouts in different scales from garden railways 32mm up to 7¼”. There is plenty of free parking at the site and a very good refreshments area serving snacks and hot meals. There is of course a gift shop ready to lighten your wallet for the usual selection of must have memorabilia. 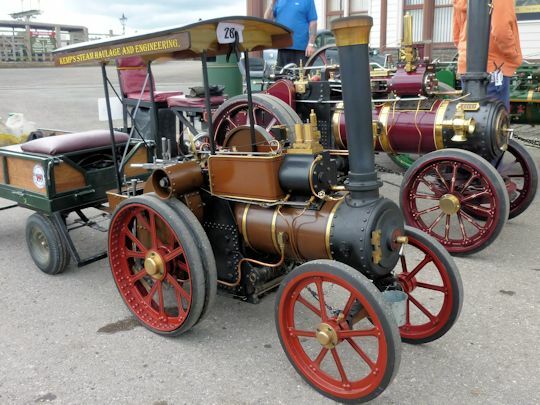 There are several “special event” weekends throughout the year and this weekend there was a model traction engine rally organised I think by VAMES. 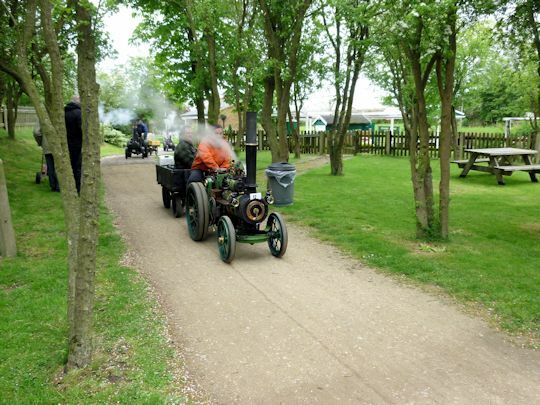 There were quite a few engines about steaming merrily from the main car park along the road to the model railway area about ½ mile. Unfortunately the weather was less than kind and there were very few visitors about to take rides and a few exhibitors dropped the fire and packed up early. Apparently Saturday was much better both weather and visitor wise. Still there were some fine examples on display. Neatly parked for a photo opportunity three 4″ scale models. 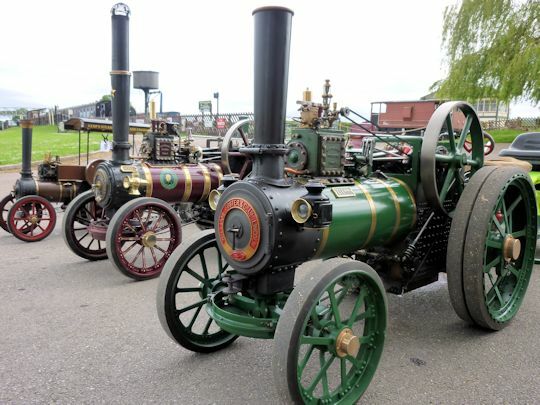 Two Foster′s “Lilian” and “Lesley” and a Ruston & Proctor steam tractor. 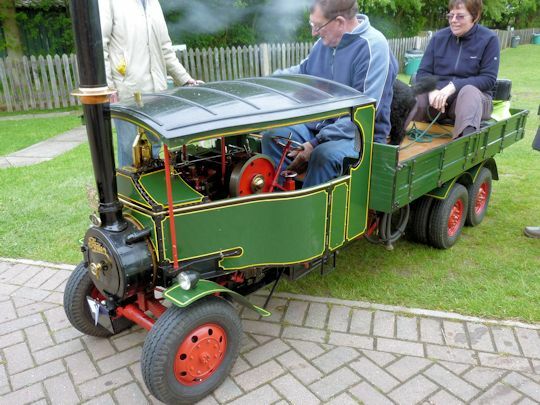 The Ruston looks to be a different scale but the original was only some 12′ long, probably one of the smallest traction engines made. 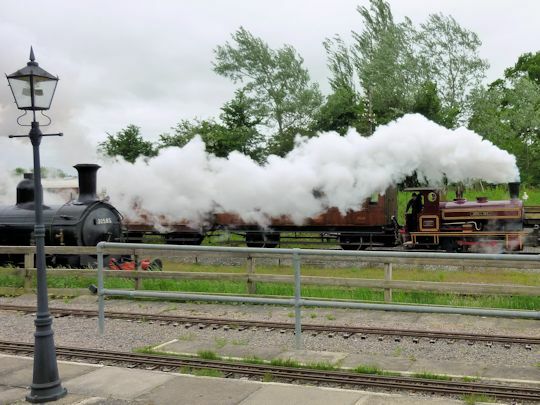 Providing nostalgic rides for the day were the 2-4-0 Beyer Peacock well tank No.30585 “Beattie” and the 0-4-0 Andrew Barclay saddle tank No.699 “Swanscombe”. 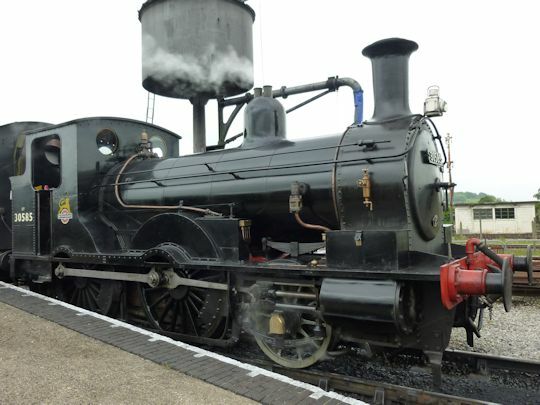 It is possible that I have misidentified 30585 as it seems to have been regularly moved about, refitted, renumbered and re-liveried over the years. Seeking refuge from the wind and squally showers, the main visitor centre building is light and airy and houses a large display area set up like a couple of platforms, the very pleasant restaurant with plenty of seating, the gift shop, toilets and play areas for the the kids. I assume this building was once an engine shed as one of the current displays is a full size loco and tender a GWR castle class engine No.5080 “Defiant” (ex Ogmore Castle). There is a traverser at the rear of the building which explains how the engine and carriage displays can be brought in and out. Back outside the VAMES area was fairly quiet but still a couple of engines running and the Foden steam wagon had made it’s way there from the car park. The ground level tracks make their way past a pleasant wooded area set out with picnic tables but no one was brave enough to try outdoor dining today. There are plenty of static displays outside, London Underground District Line stock, South African Railways 3′ guage loco. The 6989 Wightwick Hall Restoration Group are based here and depending on what they are doing at the time you can view their progress on the loco. 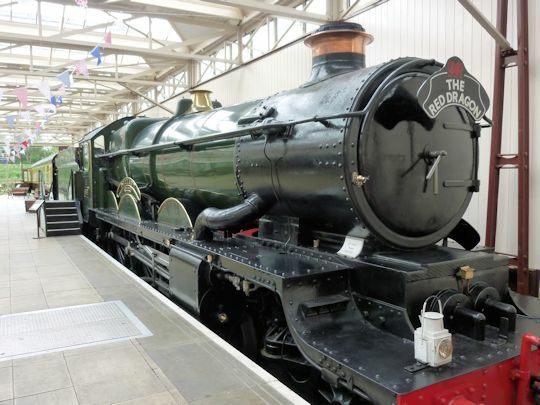 Also based at the centre are the 7200 Trust restoring one of GWR′s 2-8-0 heavy freight tank locomotives. The centre also has a museum in the “Buffer Depot” with many interesting displays of rolling stock, equipment and small artifacts. A full size W.H. Smith bookstall set up as it was on the platform at Chalfont and Latimer Station. Just outside the museum are a number of remaining “Romney” huts which were built on site by the Ministry of Food around 1941 as food stores, one of a number of such stores just outside London. A good day out despite the weather, well worth a visit if you have an interest in railway history and preservation or just like train rides.